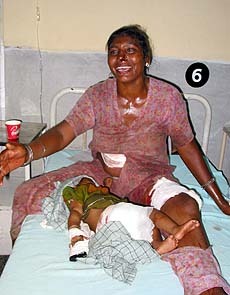 A woman cries next to her child in a hospital ward in Jammu city. A woman shouts at police officers after militants shot indiscriminately on slum dwellers. Twentyfive persons were killed and 30 injured when militants hiding in two shrines in Kasimnagar area here opened indiscriminate fire this evening. Official sources said, on a tip off, security forces launched a raid to nab the militants in Kasimnagar in south Jammu around 1930 hours. When challenged, the ultras opened fire, leading to the casualties. The injured, several of them in serious condition, have been rushed to hospital. Those killed were mainly civilians. The operation was on when reports last came in. Amid intermittent but heavy exchanges of firing and grenade bursts, policemen were trying to evacuate some injured and the dead, which were still lying near a temple and school compound, as most of the people residing in the area have escaped to safety, the official said. “Some of the members of my family are still there either dead, injured or alive but hiding, which is not known to me . I received two bullets fired by a militant and was rescued here”, 21-year-old Sanjay with shoulder and arm injuries said at Government Medical College (GMC) hospital said. Sanjay further said the militants, who were heavily armed, and looked thin and tall, had come from Gujjar Nullah crossing a high mountain peak into the Kasim Nagar area and resorted to heavy firing and threw grenades. There was a pall of gloom in the entire area as hundreds of people of the area were unaware of the whereabouts of their relatives and families. Eyewitnesses said a group of eight to ten militants stormed the colony at 7.40 p.m. and began to hurl grenades indiscriminately on the slum-dwellers who were outdoors as there was a power cut in the area at that time. Some people were buying goods from nearby shops. The terrorists hurled three grenades in quick succession. 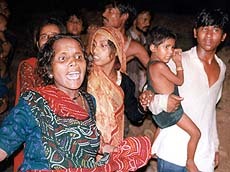 Maya Devi said soon after the ultras hurled grenades, people began to run helter-skelter following which the ultras opened fire from their Kalashnikovs. Another eyewitness Vinod said the ultras wearing turbans descended from the nearby hills overlooking the area and hurled grenades swiftly one after the other. Thereafter they sprayed bullets indiscriminately on the bystanders and passers-by. No militant group has claimed responsibility for the attack which comes in the backdrop of rise in cross-border infiltration in the past two weeks. The toll may rise as the bodies may be lying in the locality, the sources said, adding due to darkness and continued exchange of fire between security forces and ultras it was not possible to carry a thorough search in the area. The traffic on both sides of the Narwal bypass and its adjoining areas has been stopped. Meanwhile, high alert has been sounded in the entire Jammu city and nakas are instructed to carry thorough searches of vehicles. In a major haul, the security forces today seized 833 kg of highly explosive RDX from three persons in Anantnag district of Jammu and Kashmir, official sources said here. During random checking on the national highway at Bijbehara, Indo-Tibetan Border Police (ITBP) personnel, found the explosive being carried on a horsecart and detained three persons . They have been identified as Bashir Ahmed Bhat, Ali Mohammad Bhat and Ali Mohammad Rather. Meanwhile two militants of the banned Lashker-e-Toiba and two civilians, including a woman, were killed in different encounters in Jammu and Kashmir and the police arrested a ultra and seized a large quantity of ammunition since last evening, a police spokesman said here today. The two Laskar militants were killed in two separate encounters at Chatabal in Srinagar and Kralagund-Pajgan in Anantnag districts early today, he said. Two AK rifles, a pistol, a grenade and a wireless set were seized from the slain militants identified as Abu Umaid Amir and Mushtaq Ahmed alias Abu Obaid. However, locals alleged that Mushtaq, a district commander of Laskar was arrested from the Beerwah area of Budgam district yesterday and shot dead in a “fake encounter” at Chatabal in Srinagar early today.